Buff Trivia Questions of the Week … Tad Boyle has coached Colorado to six of its ten 20-win seasons. What other seasons did the Buffs finish with more than 20 wins? What were the post-season results for those teams? 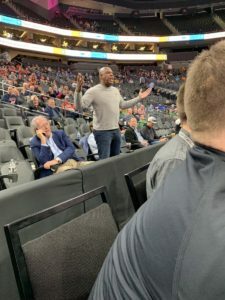 Tucker was also a fixture at CU home basketball games during the Pac-12 campaign, actually hanging out with the C-Unit for some of the UCLA game. Tucker has also worn his Chauncey Billups jersey to a Denver Nuggets home game (we won’t talk about his air ball attempt at a free throw). You have to be excited about Mel Tucker’s P.R. skills. No, it doesn’t take much for Tucker to wander across campus to watch the Buffs play at the Events Center. But I can’t remember Mike MacIntyre ever making it to a game. What I am still working out is whether it was a good thing or a bad thing that Tucker was in Las Vegas on the eve of his very first set of spring practices as a head coach. For now, I’m going with it being a good thing. Tucker isn’t tucked away in the Champions Center, mulling over every minute detail of the upcoming practices. That to me indicates that he is confident that he is prepared for Monday, and ready to get it going with his players. I was at work Thursday afternoon during the Colorado/Oregon State quarterfinal game. While I wasn’t able to watch the game, I was able to check in from time to time on my computer. It was great watching the score move in CU’s favor … 7-0 Colorado to start … 18-8 at the ten minute mark … then 28-8 after a Shane Gatling three-pointer forced an Oregon State timeout with 6:50 to play. Then … it was 31-10. I immediately flashed back to last October, and another 31-10 scoreboard. It was 31-10 last October 27th when another Colorado team lead another Oregon State team by that same score. At the end of the third quarter, the score was: Colorado 31, Oregon State 10 … and the Buffs ended up losing in overtime, 41-34. It couldn’t happen again, could it? It didn’t look like the CU basketball team would fold the way the football team did, as the Buffs took a 37-18 lead at the half. I was able to check on the score once early in the second half, at it was 43-24, Colorado. It appeared that the Buffs were going to be able to avoid the second half stumbles the football team endured. By the time I was able to get back to the game full time, it was 51-45, CU, with eight minutes still to play. Fortunately, the basketball team was able to avoid the collapse against Oregon State that happened last October, pulling away late for a 73-58 win. Perhaps 2019 will be kinder to CU athletics, after all. This week, Stewart Mandel at The Athletic posted a scathing article on admissions bribery scandal entitled, “USC confirms its country club status in the worst way“. The opening … If​ sports are considered​ the “front​ porch” to a university, USC’s​ has broken glass​ in​ the windows, gaping​ holes where​ there​​ should be stairs … and a raging fire rapidly incinerating the whole thing. On Tuesday, three Olympic-sport coaches and a senior administrator at USC were part of an explosive national college admissions scandal in which parents paid expensive bribes to get their kids admitted to prestigious universities. Many other coaches and schools were implicated, including crosstown rival UCLA, but none with the same scope of involvement as that of USC. It’s just the latest black eye for an athletic department that’s been attempting to set a world record for them over the past decade or so. And they’ve got to stop. USC means too much to its loyal alumni, the Pac-12 and the city of Los Angeles to be such a chronic source of shame and embarrassment. In the university’s characteristically arrogant fashion, its interim president, Wanda M. Austin, had the temerity to write a letter Tuesday stating “USC is a victim” (underline theirs) in a scheme that happened to involve its second highest-ranking athletics employee and a 16-time national championship coach. The school has quite a bit of experience lately in this crisis management bit; less than 18 months ago, ex-basketball assistant Tony Bland got caught in his own bribery sting, this one the FBI’s running investigation into college hoops pay-for-play schemes. (Bland pleaded guilty earlier this year.). I understand the economics. If USC is in the College Football Playoffs, CU gets more money. If UCLA is in the Final Four, CU gets more money. I’d just rather CU be getting bigger paychecks by making the playoffs and the Final Four on their own. That would just be an added bonus. There were reports over the past few months that promising offensive lineman Frank Fillip had left the team. Fillip, who started two games last fall at right tackle, is not only on campus, he is impressing strength and conditioning coach Drew Wilson. From the Daily Camera … In a recent conversation with BuffZone.com, Colorado director of football strength and conditioning Drew Wilson talked about the offseason program in general, as the Buffaloes prepare for spring football next week. OL Frank Fillip, So. : “He’s back and he’s in the saddle and working again. He’s been positive. He had to take care of some personal stuff. He’s part of the family and he’s been working hard. You have to give him credit.” (Fillip missed the first few weeks of offseason training while undecided on whether or not to play, but Wilson said he’s got both feet in at this point). While Fillip may not be counted upon immediately to be a starter this fall, he does bring a 6’7″, 280-pound body to the offensive line. An offensive line which is being counted on to improve this season … and lead the team to a bowl bid. The 2002-03 Buffs lost to Michigan State in the first round of the NCAA tournament. Filip has both feet in? Good to hear as he was good enough to play as a freshman and mans a critical position for this team. Even better it seems Mel has both feet in too. You say MM never went to a Buff hoop game? He obviously did have one foot out all the time toes feeling the SEC water. He is there now. I hope his D never has to see a tight end heavy offense. “Failure is not an option” doesnt seem to apply for far to many coaches.